Located immediately beside Dublin, County Wicklow is renowned as the ‘Garden of Ireland’ due to the diversity and quality of its landscape. Rolling mountains, conical peaks, glaciated valleys and deep lakes characterise the Wicklow Uplands. Every element of Wicklow’s landscape has the imprint of human activity. Many of these habitats are of EU importance and therefore are designated as Special Areas of Conservation (SAC). Blanket Bog is an internationally important habitat which has been present in the Wicklow Uplands for c. 4000 years. It is found wherever a deep layer of partially decomposed plant material has accumulated to form peat. It is a lack of oxygen that prevents the complete breakdown of plant material. 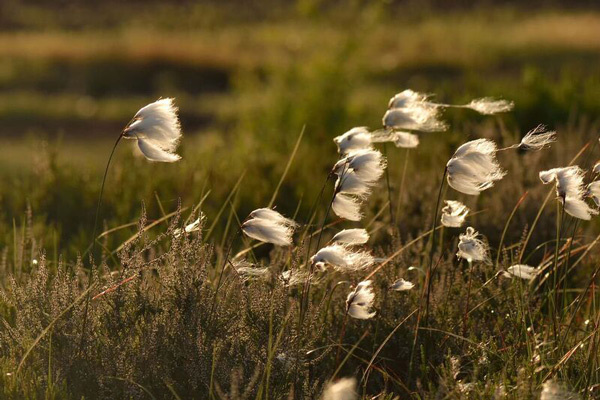 This important habitat spreads to cover large areas, giving the name ‘blanket bog’. A typical area with blanket bog is found in the Sally Gap region. Blanket Bog in the Wicklow Uplands is important for biodiversity as it is the only example of extensive upland blanket bog in the east of Ireland. The presence of this habitat is the principal reason for the designation of large areas of the Wicklow Uplands as being of international biodiversity importance. Actively growing blanket bog will be very wet with pool systems and have a significant cover of bog moss, lichens, cowberry and heath rush. Low growing ling heather may also be present with some bilberry, white grass and tormentil. Poorer quality habitats will have a less diverse range of these plant species.